LUXURY AND STYLE ARE THE KEYWORDS FOR THIS JUST COMPLETELY RENOVATED 2 BEDROOM, 2(!) BATHROOM FULLY FURNISHED TOP FLOOR APARTMENT WITH SUNNY BALCONY AND A GREAT VIEW OVER THE DUNES OF "MEIJENDEL". This apartment has recently been renovated completely, everything brand new including a luxurious fully equipped open kitchen and two(!) bathrooms! The furniture is tasteful and of a high quality. Good location with shops, beach, dunes and public transport within walking distance. Communal entrance, elevator to 3d floor, entrance apartment, large L-shaped hall with separate modern toilet, very bright living-/dining room (app. 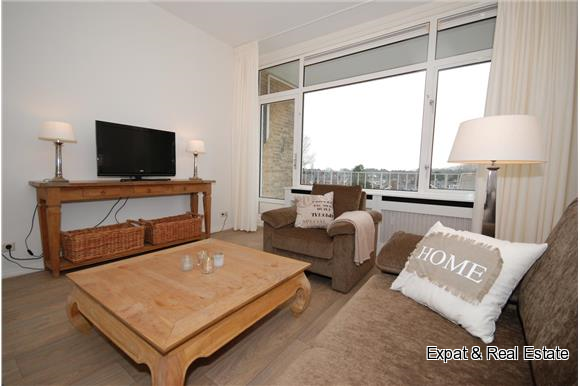 11.15x3.75m) with access to the sunny balcony, brand new open kitchen with all built-in appliances (fridge, freezer, dishwasher, combi-oven, ceramic hob and extractor), large master bedroom (app. 4.60x3.58m) with lot's of wardrobe space, ensuite bathroom with walk-in shower and vanity unit, second bedroom (app. 4.17x2.38m), 2nd ensuite bathroom with shower and sink. Separate (bicycle) storage in the basement.